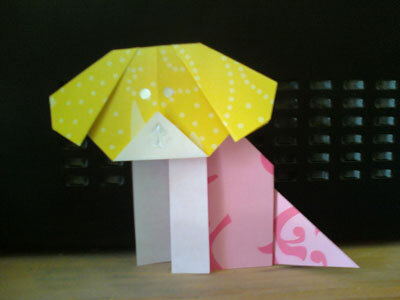 Here are the earlier photos of the origami dog submitted by readers. You can find more recent submitted photos on Page 2. 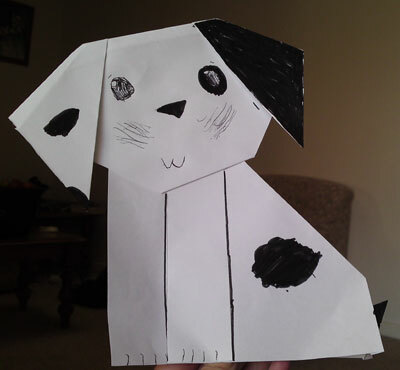 From Amelia of Des Moines "Here is my origami puppy! 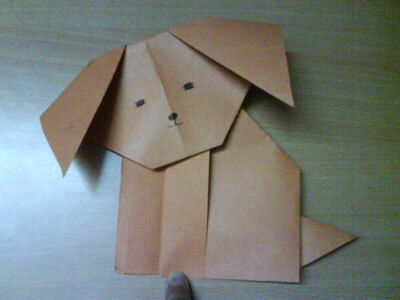 I used golden retriever origami paper. His name is Sport! 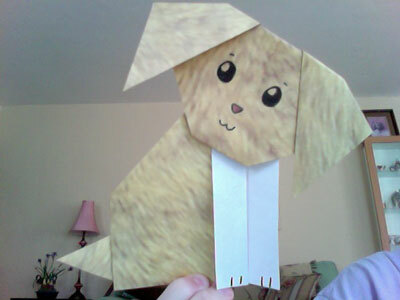 :D"
From reader in San Diego "My mom and I had a lot of fun making this origami dog. We made it giant version." 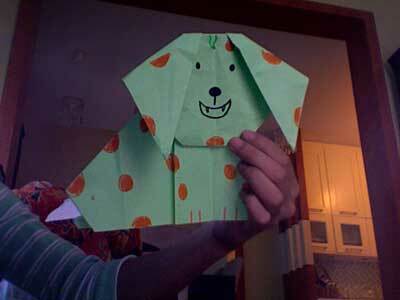 From reader in Indianapolis "This is Pinky!!!" 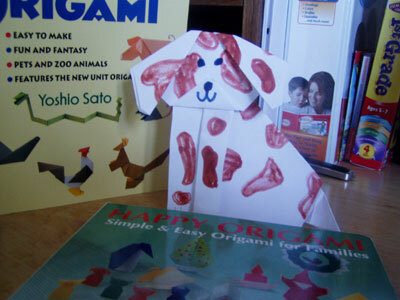 From Julia in Novato " My origami dog, Sparky, is three years old. He's funny, too. " From Ronan in Perth "This is Champ!" 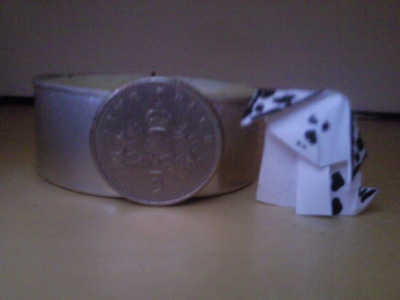 From Domenic and Adrian in Adelaide "This is very easy. I know it off by heart. It's so cool. 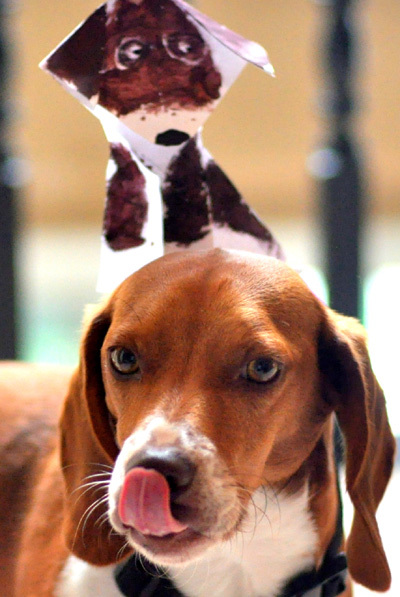 All my friends think I'm awesome!" 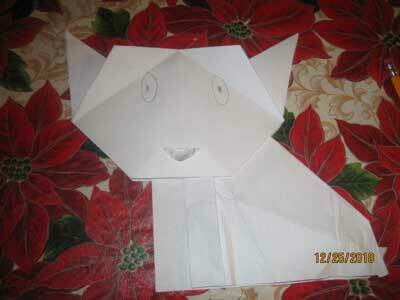 From A in Gold Canyon " I made a chihuahua. His name is Chiwi!!! " 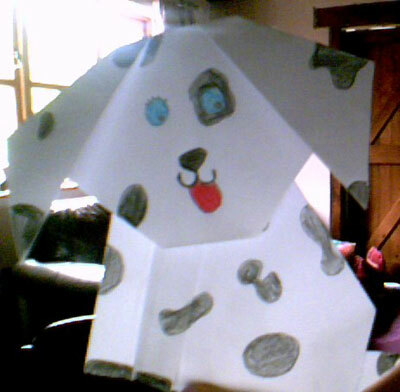 From Heather in Woking " my children and i made origami dogs. they had a blast! " 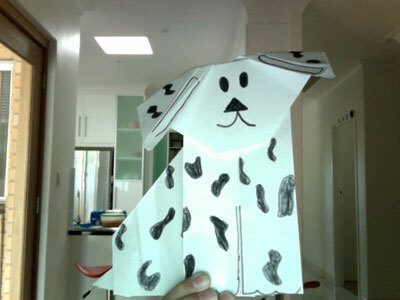 From Kyron in Perth "This is an easy origami animal and I encourage beginners to try it." 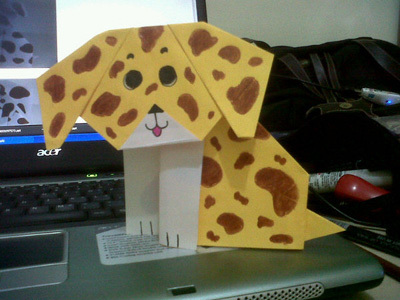 From Theresya in Jakarta " this is fun and simple! 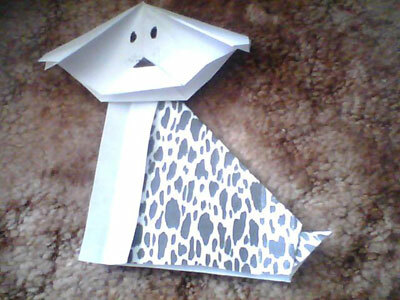 I named him as Jitterbug :3 "
Love how you decorated Jitterbug! 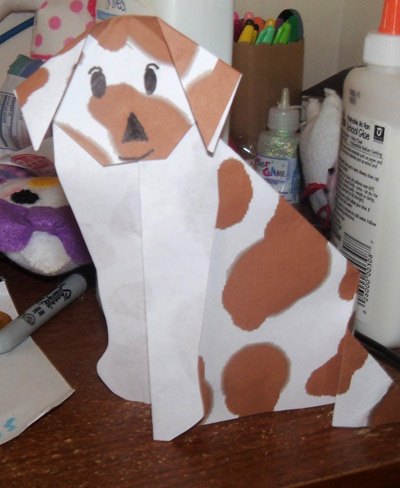 From Raymond in Carlisle " Origami Dog - Named Timmy :)"
From Oliver in Agoura " This is my origami dog in comparison to my real dog Milkshake. Not much constrast! 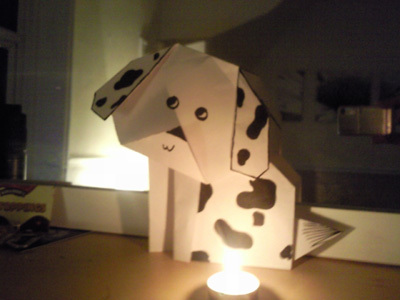 Thank you for showing me how to make this! " 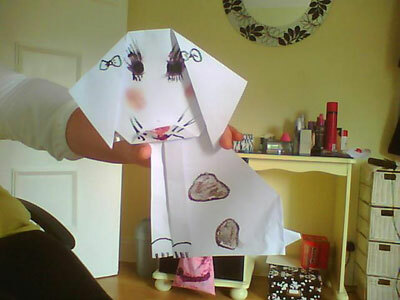 From Raymond in Carlisle "Her is Pippin!" 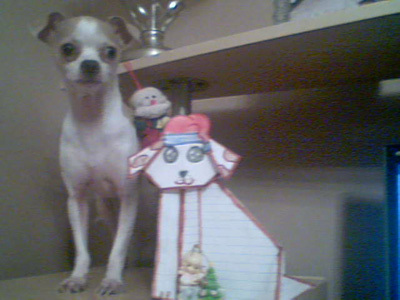 Love how you have your origami dog standing next to your real dog, Sam! They look quite alike! 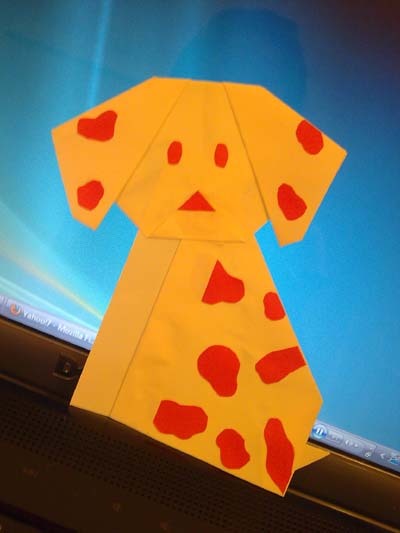 From reader in Avondale " this is of the dog , its was fun and easy to make for me a beginner.Thank you for the instructions. " 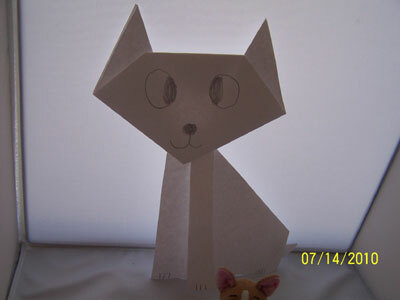 From reader in Los Angeles " This is my origami dog.His name is Duey.he's a crossbreed of chiwawa(however its spelled) and miniture pinscher.i made him all by myself. "